Geothermal Energy, makes use of the energy stored as heat in the water deep below the Earth’s surface. 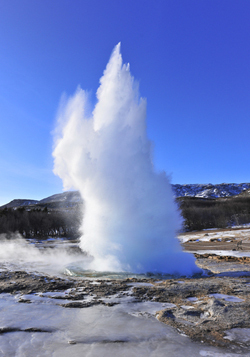 The most prominent and visual example of this coming from “Geysers” and “Hot Springs” ejecting large columns of very hot water, steam and gases high up into the air in spectacular fashion. Geothermal Energy is another renewable energy resource as it uses the immense and limitless natural heat stored deep within the Earth’s core. In fact the word “Geothermal” comes from combining together the two Greek words of Geo, meaning “Earth”, and Therme, meaning “heat”, with the resulting word “Geothermal” actually meaning “heat generated from the Earth”, then the expression “Geothermal Energy” literally means “heat energy generated from the Earth”. Once available, geothermal energy can be used either directly or indirectly as an alternative energy resource to both heat and cool our homes. So how does Geothermal Energy work. Geothermal Energy is an alternative natural energy resource based on underground hot water sources as it draws its heat from the Earth’s core. The heat from the core is extremely hot and powerful enough to melt rock into a hot liquid within the Earth called magma, and it is this liquid magma which we now call lava once at the surface we see flowing out of the tops of volcano’s. The magma cools down the nearer it is to the Earth’s surface forming a solid mantle that surrounds the core. We continue up from the center until finally we reach the surface of the planet itself and the outer core called the Earth’s crust. This abundance of heat is what we use as geothermal energy because the use of this heat is considered environmentally friendly, free, non-polluting and renewable as there is a constant terrestrial heat flow from the inner core to the Earth’s surface. Although the upper layer of the Earth’s crust, close to the surface is not very hot, it gets much hotter deeper below ground due to conduction of the heat from the Earth’s core. Water either from the rain or oceans seeps down through geologic holes, cracks and faults in the Earth’s crust absorbing heat as it travels through the hot rocks below. As a result, the water becomes superheated by the immense temperatures and pressures just a few hundred metres down, emerging back under pressure to the Earth’s surface as geysers and hot springs. This water is hot enough to be used for cooking, bathing or heating our homes. Sometimes this “geothermal hot water” becomes trapped in underground voids being unable to reach the surface, forming geothermal reservoirs. The average geothermal heat source just below the Earth’s surface (usually 2 to 3m), never deviates far from 50 to 70oF (10 to 21oC), and which can be used directly for building heating or for preheating of conventional high temperature energy supplies. However, at certain specific locations, for example around geysers, hot springs and volcanic areas, increased temperature gradients occur due to the formation of the ground providing a significant geothermal resources many times hotter than at other such locations. • Direct Geothermal Energy – this is where the hot water is available either on or very close to the Earth’s surface and can be used directly for heating, bathing or washing. • Ground Source Geothermal – this is where the geothermal hot water resource is below the ground but not too deep allowing easy access of the geothermal resource using pipes and bore holes. • Geothermal Power Plants – these harnesses the extremely hot water or steam using vertical bore holes drilled deep underground and then uses the available geothermal steam to generate electricity. Then we can see that there are basically two main types of “Geothermal Energy”. One where the energy can be used directly, as heat or hot water, and the other where it can be used indirectly as a means of generating electricity. Geothermal is very well suited for home heating and cooling by installing either a geothermal heat pump or a geothermal heat exchanger for direct use. Since this energy resource is constantly being re-supplied by the sun and the surrounding Earth, “Geothermal Energy” is a renewable energy resource. Let us understand that geothermal is NOT mining, as mining removes the mined material forever, it is extraction of the heat from a hydrothermal fluid which is replenished, sometimes over very long periods by the Earth itself. Also the heat transport medium, the water, eventually cools down and returns to Earth via the usual natural processes to be reheated again. One way of extracting this heat energy is by the use of a Geothermal Heat Pump. The geothermal heat pump doesn’t create electricity, instead it circulates a thermally conductive liquid through pipes (an Earth loop) buried underground operating on the same principle as the domestic refrigerator but in reverse. A Geothermal Heat Pump, also known as a “Ground Source Heat Pump”, is a very efficient way to heat and air-condition homes and buildings as it can move heat in two ways: during the colder winter months, low temperature heat is withdrawn from the ground (the heat source) for direct use in heating buildings and other structures. In the hotter summer months, the geothermal heat pump operates in reverse removing the heat from the building and dissipating it back into the ground. As a result of this simple process, direct use geothermal heating is becoming very popular for the home owner as it is a cost effective alternative to expensive oil or gas home heating systems. Energy savings using a ground source heat pump can be substantial over a long period of time. In most residential geothermal heat pump systems the heat available below the surface is removed from shallow ground, i.e. less than 3 metres or 10 feet down. The transfer of the geothermal heat is accomplished by the means of an antifreeze and water refrigerant solution circulating within plastic polyethylene pipes and loops buried horizontally (or vertically) in the ground. The refrigerant circulates through a cycle of condensing and evaporating between two heat exchangers. One heat exchanger evaporates at low pressure and absorbs heat for cooling while the other compressor pushes the refrigerant vapour, now at high pressure, to another coil where the refrigerant condenses and releases the heat for heating. Unlike refrigerators and air conditioners, geothermal heat pumps can work in both directions taking heat from the ground to heat the home and dumping excess heat back into the ground for cooling of the home. The addition of a small scale electric heat pump into a geothermal system allows the use of low temperature geothermal energy in homes and offices. The heat pump unit generally sits inside a building for protection and is connected internally either to a low temperature under floor or wall mounted heating system, or is integrated into a fan assisted air conditioning system delivering both hot and cold air depending upon the season. A heat pump does not generate electricity, but uses a small amount of electricity to transfer large amounts of free thermal energy in both directions between a building and the surrounding ground according to the heating or cooling requirements. Geothermal heating and cooling systems can be installed in the garden or land surrounding a suburban home or other building. The ground loop (also known as an Earth loop), transfers heat to and from the ground and depending upon the amount of garden, plot or land available. These closed loop, ground loops which can be horizontal, vertical or spiral in nature are made of durable, high-density polyethylene pipe, buried deep in the ground or even submerged in a deep enough lake or pond. If adequate land is available, horizontal trench Earth loops can be installed. This involves one or more shallow trenches being dug with the polyethylene pipes laid out flat horizontally inside the trench before being backfilled. There are various designs of horizontal earth loops, using either one, two, three or more parallel branches within a single trench design depending upon the spacing. The more pipe per metre of trench, the shorter the trench can be, with pipe lengths normally ranging from 30 to 100 metres (100 to 300 feet) depending upon the design. Another type of horizontal Earth loop design uses coils or loops of pipe inside the trench instead of straight rows. In this installation, the trench is dug the same as before, but instead of laying the pipe out flat in straight lines, layered spiral coils of the pipe are spaced evenly throughout the length of the trench, similar to a flattened, stretched out spring. The advantage of this type of Earth loop installation is that there is more pipe per metre used in a smaller trench area making it a more compact design for smaller gardens or plots. However, the disadvantage though is that the heat resource is removed from a much smaller footprint so less heat is extracted from the ground. As well has horizontal closed Earth loops, vertical Earth loops can be used where space is limited or where the local conditions are not suitable to horizontal loops, such as hard or rocky terrain. However, unlike horizontal loops which use a shallow trench, vertical Earth loops require the use of a drilling rig to drill one or more bore holes about 30 to 80 metres (100 to 250 feet) deep. One drilled, a special double pipe or two single pipes connected together with a U-bend is inserted and pushed down into the hole until it reaches the bottom. The hole is back filled to provide a good thermal contact around the pipe and to seal the hole. The vertical pipe or pipes are then connected to a header system at the surface. The thermal capacity of a vertical loop system is not based on depth, but rather on how much pipe is in the ground and the overall thermal conductivity of the bore hole. Vertical Earth loops can also be used as part of an open loop geothermal energy system. Open Earth loops are the simplest geothermal energy design. They use ground water pumped directly from a well or bore hole as a heat source. The low temperature water is pumped up from a single well or bore hole, the heat is extracted and the water is then returned back into the Earth using a second bore hole or well so that the process can be renewed over and over again. If clean enough, this waste water can also be discharged into a ditch, stream or pond if available. The costs involved in the installation of an open loop geothermal energy system is usually a lot less than a closed Earth loop system while delivering the same high efficiency. The disadvantages of an open loop geothermal design is that depending on the quality of the water being used from the well, water filters and periodic cleaning of the heat exchanger inside the unit may be necessary. Also, geothermal water containing too many contaminants such as salts and dissolved minerals, may not be suitable for use with a geothermal system so proper testing of the water prior to installation may be required. We have seen above, that geothermal heating and cooling systems can be connected to the Earth in a variety of ways. Horizontal closed loop installations are generally more popular and cost-effective for small installations, particularly for a new construction where sufficient land area is available to bury the pipe work before construction of the foundations begins and if properly installed, they are economical, efficient, and reliable. The length of the loop piping will vary depending on ground temperature, thermal conductivity of the ground and system design but as a rule of thumb, the longer the pipe work the better. Vertical closed loops are used in many situations where the land area required for a horizontal loop installation is not available. Vertical Earth loops also minimize the disturbance to existing landscaping but the drilling of a deep bore hole may be more costly than excavating a shallow trench. Geothermal Energy Systems are efficient, environmentally sensitive, comfortable, and economical as they use 25 to 50% less electrical energy than conventional heating or cooling systems. Geothermal heat pumps use small amounts of electricity to transfer the heat, and not to generate it by the burning of fossil fuels making geothermal energy extraction an alternative energy resource. Since a geothermal energy system burns no fossil fuel to produce heat, it generates far fewer greenhouse gas emissions than a conventional furnace, and completely eliminates a potential source of poisonous carbon monoxide within the home. The following list summarises many of the geothermal energy advantages and disadvantages of using geothermal energy as a renewable energy source. Geothermal energy is a well-proven energy resource that can be used to provide both heat and electricity. Geothermal energy is a clean energy source as no fossil fuels are burned, so there are no air pollutants. In most cases the geothermal fuel, the hot water is “free” for extraction. Geothermal energy produces little or no emissions. Geothermal energy resources exist in many areas of the world for both high and low temperature applications. Once built, geothermal power station operating costs are small making geothermal generated electricity much cheaper. The steam used for electricity production is turned into water and recycled back into the Earth. Ground based geothermal heat pumps for heating and cooling can be used almost anywhere. Using geothermal energy directly for heating applications can be up to 70% more efficient. Geothermal energy is renewable only if the rate of fluid extraction is less than the recharge rate. Geothermal energy may not be considered as a renewable resource only a sustainable one. The heat is generated within the Earth by radioactive decay. Poorly distributed around the world as not every area has access to a geothermal source. Initial capital & installation costs are higher but has potential long term savings compared to conventional HVAC systems. Requires large areas of excavation for horizontal trenches. Requires drilling bore holes deep into the ground for vertical wells. Land subsidence from deep drilling and water removal may be an issue in some areas. Problems with corrosive water and mineral deposits taken from the ground and exposed at the surface. Geothermal sites can run out of steam, as their temperatures drops too low. May require the drilling of new wells after a few years of use. While there are many advantages and disadvantages to geothermal energy listed above, the Earth can provide a large source of free energy and its stored heat in the form of Geothermal Energy is by far the more abundant resource. Compared to other forms of alternative energies such as solar and wind, geothermal energy has been overlooked as a simple cost effective way to heat and cool our homes and offices. Although geothermal technology is well developed with many companies now selling very efficient geothermal heat pumps and systems, its potential has barely been tapped. With new sources of fossil fuels becoming increasingly difficult to find and extract from the Earth, clean and sustainable geothermal energy can be used to solve our environmental problems and provide us with our long term energy needs. Impressive and well-written article. This spared me from all those jargons that I can’t understand in an instant. Marvelous. Highly educative and informative write-up. Another awesome article. Yes civilengineersforum.com/geothermal-energy-advantages-disadvantages to provide both heat and electricity. But its another disadvantage is that Geothermal energy is limited geographically. Thanks for the nice list. This page about geothermal energy is really good at explaining how it works. I have been researching this for a few months now to install geothermal heating in my bungalow but digging up my garden to install the pipework is still a problem for me.